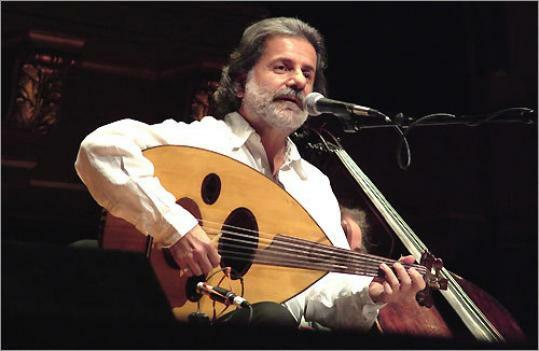 Marcel Khalifé is often described as the Middle East's Bob Dylan. Eastern classical music is well represented tonight in Boston, with two concerts showcasing some of the most beloved and celebrated artists in the Arabic and Hindustani traditions. For both Bombay-raised Zakir Hussain and Rahul Sharma, who perform a duo recital at Sanders Theatre, and Lebanese-born Marcel Khalifé, who plays music from his gorgeous new CD, "Taqasim," at the Berklee Performance Center, ancient classical traditions have served as a launching pad for far-reaching musical explorations. Often described as the Middle East's Bob Dylan, Khalifé didn't set out to transform Arabic music. A master of the oud, the pear-shaped, 11-string fretless Middle Eastern lute, Khalifé was finishing his studies at Beirut's National Higher Conservatory of Music when civil war erupted in 1975. He sought succor in the flowing verse of celebrated Palestinian poet Mahmoud Darwish, setting his poems to music. Recording songs such as "Jawaz al-Safr" ("Passport") and "Ummi" ("My Mother"), Khalifé combined aesthetic innovation with a genuinely populist sensibility. The music captured the imagination of a huge swath of the Arab world, and Khalifé became a star transcending the region's religious and national fissures. "I wanted to do something, and this poem was with me," says Khalifé, 57, speaking in French through an interpreter before a recent concert in San Francisco. "I started to create these songs, and they became popular very quickly. But at the time it was really for me, not for the public or the future or history. It was for my pleasure and my needs. I was looking for light in the poems, and this light burst forth." Over the past three decades, he has created a remarkable body of music, including compositions for solo oud, orchestral works, film and ballet scores, and his tremendously popular songs. But in recent years Khalifé has been determined to swim against the tide of Arab culture by carving out space for instrumental music, emphasizing his work as a player and composer. "Poetry is essential in Arab culture, and most Arabic musical creations have been based on lyrics and poetry, but it's also true that some composers and musicians have created significant instrumental works, experimenting with solo pieces for classical Arabic instruments such as oud and qanun," Khalifé says, referring to the dulcimer-like Arabic harp. "I took this a step further, and for the first time, instrumental music has reached the people and been well received despite its experimental nature." While his latest work, "Taqasim," is an instrumental tour de force, Khalifé hasn't left the written word far behind. Conceived for a trio of oud, acoustic bass, and percussion, the hourlong piece was inspired by Darwish's poetry. Released earlier this year, "Taqasim" is an intricate three-movement work that flows from Darwish's rhythms and imagery. "What's special about it is that I'm specifically avoiding his voice and song," Khalifé says. "I'm stressing the use of instrumental music to express the essence of Darwish's poems." Presented by the American-Arab Anti-Discrimination Committee of Massachusetts, tonight's concert is a benefit to bring two students from the Edward Said National Music Conservatory in Bethlehem to Berklee for a five-week program next summer. Khalifé is performing with his Al Mayadine Ensemble featuring Austrian jazz bassist Peter Herbert and his two sons, Juilliard-trained pianist Rami Khalifé and percussionist Bachar Khalifé. Family is also of the essence for Zakir Hussain, an unsurpassed master of the tabla drums, and Rahul Sharma, a virtuoso on the santoor, or hammer dulcimer. They are not only carrying on the legacies of their legendary fathers - the late tabla maestro Ustad Alla Rakha and santoor pioneer Pandit Shivkumar Sharma, respectively - but also they're expanding the possibilities of their instruments while keeping one foot firmly planted in the rich soil of the classical Hindustani tradition. Indeed, the Sharma family has been the driving force behind the santoor's rise as an important voice in the Hindustani canon. In the 1930s, a respected vocalist from an aristocratic Jammu family, Pandit Uma Dutt Sharma (Rahul's grandfather), became fascinated by the santoor, a Kashmiri folk instrument used mainly to accompany ecstatic Sufi vocals. He charged his son Shivkumar with the mission of elevating the instrument's stature. By modifying the 70-string dulcimer - expanding its range to three full octaves and creating a smoother glissando so a player can sustain and slide between notes in emulation of the human voice - Shivkumar single-handedly transformed the santoor into a popular classical instrument. "He brought it out from the valley of Kashmir to the world," Sharma, 34, says of his father from his home in Mumbai. "He developed an entire style performing all the ragas on the santoor, creating rhythmic intricacies." Sharma has forged his own style, recording first with his father on 1999's "Sampradaya" on Peter Gabriel's Real World Records label, and then his own Real World session in 2000, "Music of the Himalayas." He has gained crossover renown in Asia through his collaborations with pianist Richard Clayderman, who has won a huge following with his ubiquitous orchestral pops recordings. In expanding territory for the santoor, Sharma is continuing a process that dates back centuries. "The Gypsies carried the santoor in early times from northern India into Iran," Sharma says. "From there it went to Romania and other central European countries, where it's called the cimbalom. I don't know where it's going to go next, but it's been an interesting journey." For Sharma, the opportunity to tour in the United States with the 56-year-old Hussain is the fulfillment of a longtime dream. Now based near San Francisco, Hussain was still a teenager in Bombay when he started performing with Shivkumar Sharma, and Rahul grew up watching Hussain accompany his father. In many ways, Sharma has followed in Hussain's footsteps, developing a three-pronged career as a composer, classical musician, and eager collaborator with Western artists. "Zakir is a genius in whatever he does," Sharma says. "His talent and knowledge and the way he conducts himself onstage are simply outstanding. I've always seen him at home, so he's more like an uncle. The most interesting thing is when he accompanies any artist, he combines so well that he makes it sound like it's one instrument onstage." Touring with Sharma offers Hussain an opportunity to forge a deeper relationship with a rising star he watched grow up, a musician who is rapidly emerging from his father's long shadow. "His playing stands on its own," says Hussain, in an interview at drummer Mickey Hart's sprawling Yolo Ranch in Sebastopol, Calif. "He's a fabulous young musician and a great composer. He's written music for Bollywood films and made some creative records. He's one of the most exciting young instrumentalists around, and I just felt it would be nice to get to know him a little bit better." Marcel Khalifé performs at Berklee Performance Center (136 Massachusetts Ave.) Nov. 16 at 8. Tickets are $36-100 at 617-747-2261 or adcma.org. Zakir Hussain and Rahul Sharma are at Sanders Theatre (45 Quincy St., Cambridge) Nov. 16 at 8. Tickets are $28-37 at 617-876-4275 or worldmusic.org.